This is the first definite effort to restore our old Gaelic Medical Manuscripts which have lain unknown for so many centuries. 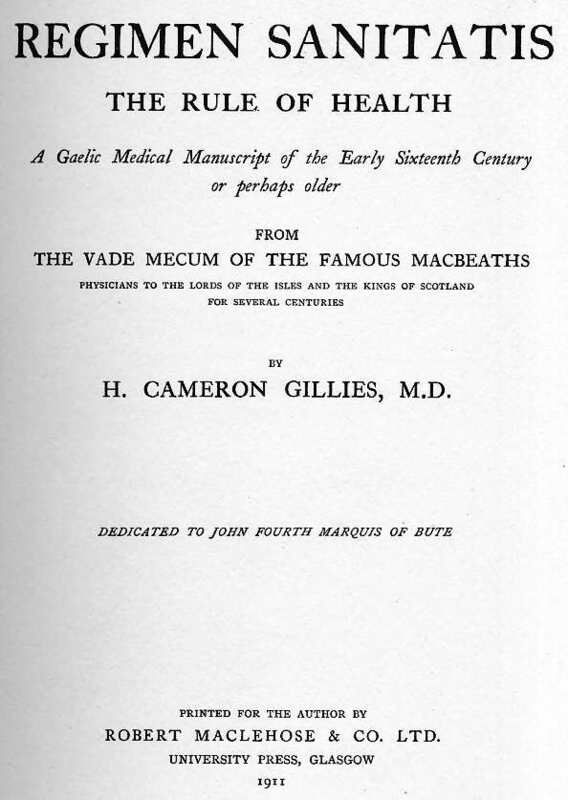 From the national-historical point of view the Text is very interesting, while from the medical-historical it is even more so, and from the scholar’s point it must be of distinct importance. I have tried to keep my eyes open in these three directions. I have been impelled to endeavour to do this work from a strong feeling that it ought to be done—that it was indeed, for long years, calling to be done. My instinctive devotion to my native language and the exceptional combination, with that, of my Medical training and my very big experience, seemed to make the call imperative that I should undertake the work, for this necessary combination in the life of one person does not occur very often. I was also encouraged by the patriotic sympathy and enthusiasm of a nobleman who does his heredity full honour by showing his keen interest in the tradition and literature of his race, and particularly in the direction which this effort so far realises. Very much remains to be done in this way, and it must be undertaken soon, because some of these MSS. are very far gone in decay—especially those written on paper. This work may encourage, as it certainly will assist, such as may wish to work in this field. Hearty thanks are due to the Publishers, who did this difficult work sympathetically and admirably.